But before we ascend to the next step – a conditional formatting of the numbers that’ll color-code crime incidence along an frequency continuum – we need to post a codicil to the pivot tabling activity we described in Part 1, one pointing to a potential disjuncture in the maps. Pivot tables work with the data they have – meaning in our case that the grouped lats and longs derive from, and only from, the actual coordinates lodged in the contributory source data. Any missing coordinates – or put very simply, those lats or longs running somewhere down or across DC that went crime-free – will appear neither in the data nor their kindred pivot table; and that near-obvious truth drives the reality that pivot tables won’t fill in those lat/long gaps, and extrapolate them to the Row or Column Label areas. For example, if the grouped latitude –77.054–77.044you see above had experienced no crimes, the table would have suffered a corresponding absence of those numbers – with a correlative crimp in the “map’s” proportionality. And once your numbers crunch melodiously you can head toward the conditional formatting department. Remember that our intention is to plot a heat map of the crime data, whereby various crime magnitudes are variously colored, along some continuum of shades – and that’s exactly the sort of thing conditional formats do. While the above menu won’t make any user friends I wasn’t consulted about it, and we’ll have to make do with it as is. And in fact, to give credit where’s it’s due, Excel has rightly noted its pivot table surroundings by asking us, in the menu’s upper third, exactly which segment of the table we want to conditionally format, though its three answers need explaining. Selected cells, the default and least likely option, will conditionally format only those cell(s) on which you’ve happened to click in order to trigger the menu to begin with. The All cells showing “Count of Offense” values selection will consider every data cell in the pivot table, including those addressed in any Total rows or columns, should these be turned on. You’ll almost surely pass on this option too, because Totals data will by definition be freighted with the largest numbers, and as such will decisively skew the conditional format coloring. We’re thus left with option 3, All cells showing “Count of OFFENSE” values for “LAT” and “LONG” – a curious-sounding locution, because it simply enumerates all of the fields currently in force in the table, and doesn’t appear to tell you anything you don’t already know. But because it’s possible, for example, that the Row Labels area could receive two fields at the same time – in which a superordinate field would be breaking out a subordinate one (e.g., Ward breaking out LAT) – this third option would then require you to start the conditional format by clicking on a cell positioned at the intersection of two of the three fields installed in the labels areas – either Ward and LONG, or LAT and LONG. But all right; if that anodyne digression has left you reaching for your brew, not to worry. That eventuality isn’t happening here. Excel has brought some heat to the map, color-grading the data by their relation to their highest and lowest numbers dotting the pivot table. 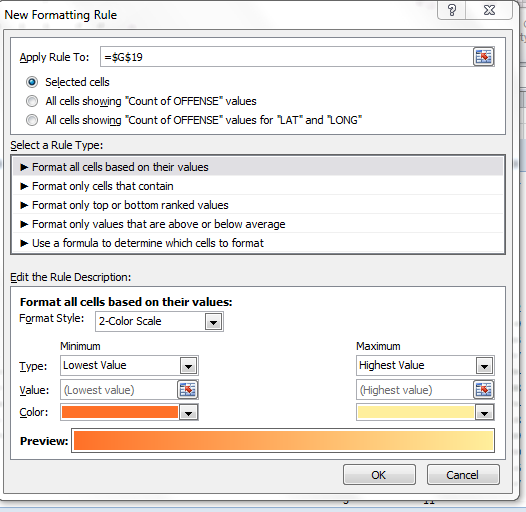 If you don’t like the gradation, return to the conditional format and pick two different colors (and you start the revision process by clicking Conditional Formatting > Manage Rules > Edit Rule, which you’ll find when the Conditional Formatting Rules Manager window opens). It’s mix and match – or, rather, mix and contrast. That procedural part is easy, but it comes with a qualification. What I can’t identify yet are the intervals across the resulting color continuum at which one color gives way to the next. As we’ve indicated, our conditional format is bounded at the extremes by Highest and Lowest-number colors, but the data in-betweens call up intermediate-value colors as well – and I just don’t know precisely where one such color elides into the next. 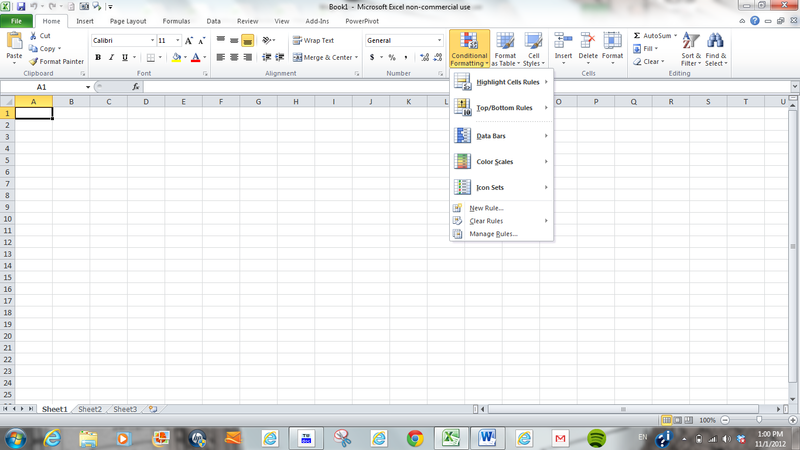 I’ve consulted several Excel books on this little conundrum, and I’ve yet to turn up an answer. Even my books don’t discuss it. Now how’s that for transparency?